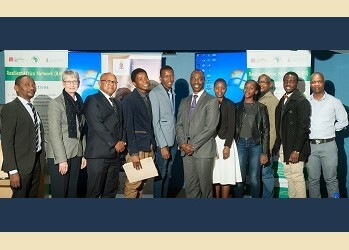 The School of Health Systems and Public Health and the Southern Africa Resilience Innovation Lab (SA RILab), in collaboration with the Department of Library Services' MakerSpace, hosted the Youth Spark Innovation Grants (YSiG) awards ceremony for winners of the Resilient Africa Network SA RILab Youth Spark Innovation Grants at the University of Pretoria's (UP's) Hatfield Campus on Friday, 27 May 2016. At the end of last year, the Resilient African Network (RAN) invited students with innovative ideas and approaches that have potential to strengthen the resilience of communities to submit their ideas in order to stand a chance to win seed grants. Project ideas could be submitted in various categories, including agriculture, health, water, entrepreneurship, gender based violence and livelihood diversification. Applications for the grant were open to students at RAN partner Universities across Africa and closed on 8 February 2016. During the ceremony, five students from UP and one student from the Lilongwe University of Agriculture and Natural Resources (one of the RAN partners universities) were awarded grants to take their projects to the next level. The winning projects will improve local communities in a multitude of ways. One of the winning projects by Kedumetse Motloutsi a second year mechanical Engineering student, intends to develop a device called the Magnon that produces electricity through magnets by applying the laws of physics and thermodynamics. This project will improve communities by increasing access to electricity for the rural and marginalised poor in a cost effective way. The device could be used to power water pumps from the ground thus addressing water shortages in poor South African communities. The other projects include 'Nubrix' by Elijah Djan, second year Industrial Engineering student which aims to produce bricks from paper for building low cost housing, development of locally appropriate energy efficient cook stoves by Joyce Grevulo a MSc Agricultural and Applied Economica (LUANAR), combating the scourge of substance abuse (particularly nyaope addiction) in communities in South Africa by Tsholanang Seakamela a BA Psychology student, and the 'Asthma grid' - a handheld, diagnostic and predictive medical device which will promote the early diagnosis and treatment of asthma, by Moses Kebalepile a Public health PhD candidate. The device will also be equipped with an early alert application that can inform primary caregivers and emergency response services through a mobile network communication system if the patient is in distress. Another project by Richard Whande, Master of Public Health student seeks to promote safer environments by rehabilitating mine dumps and providing alternative uses for neglected soil crusts, reducing air and water pollution and improve the quality of life for mining communities. The Guest of honour was Prof Norman Duncan Vice-Principal: Academic who handed out the awards to the students and gave a key note speech. The event was also graced by Prof Di Manning Deputy Dean Education, Prof Kuku Voyi Chairperson of the School of Health Systems and Public Health, Mr Robert Moropa Director Library Services, Dr Roy Mayega Deputy Chief of Party RAN, Prof Ayo Yusuf Director SA RILab, SA RILab Advisory committee members, parents of the students and other dignitaries. Students are expected to develop their projects further and to present their prototypes at the end of the 6 months grant period.